NOT SO LONG ago, you couldn’t get a good cup of coffee in Ireland. Tea was king and coffee was often an afterthought. But over the last decade or so, independent coffee shops and roasters sprang up in great numbers. Walk around the major cities and towns, and you’ll be hard pressed not to stumble upon a bustling coffee shop packed with people working on their laptops. Where once we as a country were content to drink Maxwell House, we are now a country well versed in flat whites, lattes, Aeropress, filter coffee and more. We are living in the era of the coffee shop. One of the forefathers of the specialty coffee scene in Ireland is CoffeeAngel. It has been operating in Dublin for fourteen years and has several branches across the city. It’s given owner Karl Purdy a unique perspective on how it’s developed over the years. Dublin was the first city to experience the new wave of specialty coffee shops. The likes of 3fe, The Bald Barista, Kaph, Fixx and others became beloved spots, encouraging other cafés and restaurants to up their game. But it soon spread across the country. One such coffee shop to benefit from the nationwide boom is Arch in Waterford. Arch occupies a diminutive space on George Street and there are no seats, but it has quickly become of the city’s go-to spots for a quality cup of coffee. It serves 3fe coffee and stocks products for coffee aficionados to make their own cuppa at home. It has proven so popular that it opened a second space on Peter Street just this week. Owner George McDonald attributes the popularity of independent coffee shops to the fact that independent coffee shops scratch an itch that the likes of Starbucks just can’t satisfy. Daniel Ulrichs of Coffeewerk + Press in Galway agrees with this assessment. We’re back. We will open our doors at ten o’clock today for coffee and brunch. Can’t wait to see everyone again. As the independent coffee scene has thrived, international coffee chains like Starbucks, Costa and Café Nero have attempted to muscle in. And while this technically leads to increased competition, Oliver Cruise of Network on Dublin’s Aungier Street doesn’t view them as a threat. Ah yes, trends. Over the past few years, we’ve seen coffee shops diversify beyond the usual americano/latte offering and add innovations like matcha lattes and turmeric lattes to their offering, not to mention almond milk and oat milk. Cruise seconds this, but thinks it will be some time before it’s widely available. He also has some predictions of his own. 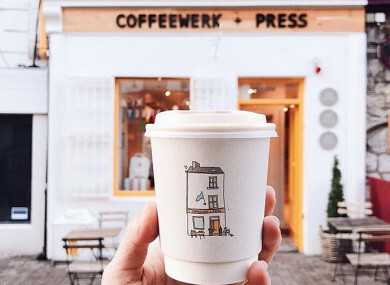 “I think cafes will become more and more aesthetically driven in their design in Ireland, as businesses try to create a very strong brand image through their fit-out. This has worked wonders for the likes of Blue Bottle in America,” he says, referring to the coffee chain that was recently acquired by Nestlé. “Another trend I have seen further afield is the utilisation of coffee shops and especially small independent ones, as a marketing tool. They generally get hundreds of consumers passing through their door and if you do it correctly, you can promote new products or events with them in a very clever way. All in all, coffee shop owners speak glowingly about the benefits coffee culture has brought to Ireland. For one thing, it’s offered an alternative to Ireland’s pub culture and helped facilitate interactions that may have otherwise happened over a pint. Fourteen years on from opening his first shop and Karl Purdy is proud of how coffee culture has evolved. “I believe we have created a wonderfully unique coffee culture that confidently stands shoulder to shoulder with the best coffee cultures in the world,” he says. Email “'Coffee shops are the new pubs': How coffee took over Ireland - and what's coming next”. Feedback on “'Coffee shops are the new pubs': How coffee took over Ireland - and what's coming next”.